Home » Delivery Information - Free delivery on all orders! 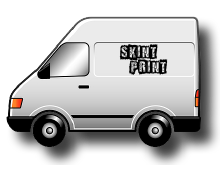 At Skint Print we don't believe in hidden delivery costs. Every price you see includes delivery to your home or business. We use several different couriers for our overnight deliveries. But whoever we use, we always try to pass on any tracking information to you, so you can follow the progress of your delivery. They will deliver your print to you on weekdays between 9am and 5pm. Don’t worry if you are re-selling or gifting your print. We deliver everything in blank packaging, no need to ask. Our standard turnaround is 3-5 working days. Please note that this is an estimate as delays can happen which are beyond our control. But last year we delivered 100% of our print orders within 4 working days. If you have a strict deadline, don’t leave it to chance. We may be able to help - just ask. To get a quote please use the contact form, we will respond within 24 hours.